Combining new, more aggressive styling, upgraded standard and available features and sporty handling, the 2016 Honda CR-Z Hybrid Sport Coupe goes on sale November 3 with a manufacturer’s suggested retail price (MSRP) ranging from $20,295 for the CR-Z LX with 6-speed manual transmission (MT) to $25,090 for the new EX-L with standard navigation (CVT). The CR-Z’s agility is backed up by its punchy hybrid powerplant that produces up to an impressive 140 lb-ft of torque (MT), while offering EPA fuel economy ratings of up to 36/39/37 mpg city/highway/combined (CVT). The hybrid powertrain uses a 1.5-liter 4-cylinder, 16-valve, single-overhead cam (SOHC) engine with “intelligent” Variable Valve Timing and Lift Electronic Control (i-VTEC®) that receives additional power from the Integrated Motor Assist (IMA®) system’s DC brushless electric motor. Powered by a 144-volt Lithium-Ion battery pack, the 15 kW electric motor assists in acceleration and also acts as a generator during braking or coasting to capture kinetic energy to recharge the battery pack. Combined peak output is 130 horsepower at 6000 rpm and 140 lb.-ft. of torque (127 lb.-ft. on CVT-equipped models), including electric-motor assist. Selectable Econ, Normal and Sport operating modes let the driver select his or her desired balance of economy and performance. In addition, the standard Plus Sport System delivers increased acceleration when the driver presses the “S+” button on the steering wheel (when the battery is more than 50-percent charged and the CR-Z is traveling over 19 mph). The CR-Z’s idle-stop feature temporarily turns off the gasoline engine when the vehicle comes to a stop under certain conditions. In this situation, the hybrid powertrain’s ECU monitors the closed throttle, speed and brake pressure to determine the driver is bringing the car to a stop. When the brake pedal is released, the engine is restarted and power is available immediately. 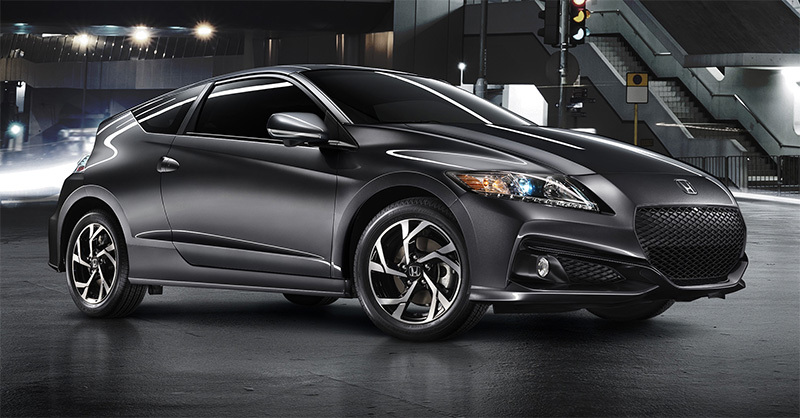 Refreshed with exterior design and trim upgrades for 2016, the CR-Z’s “one-motion” exterior wedge shape begins at its low-slung hood to form a broad forward stance, with its deeply inset beltline adding a dynamic element. Standard exterior features include power windows and power door locks, remote entry, and an Expanded View Driver’s Mirror. The CR-Z EX and EX-L model add LED daytime running lights (DRL), High-Intensity Discharge (HID) headlights with Auto-On/Off, and fog lights. Standard electronic features include the Display Audio-operated, 160-watt AM/FM/CD audio system with six speakers and speed-sensitive volume control and a USB auxiliary input jack for connection to a portable audio player. Other interior features include Pandora® compatibility, Bluetooth® HandsFreeLink®, automatic climate control and cruise control. The CR-Z EX and EX-L adds a 360-Watt AM/FM/CD Premium Audio System with seven speakers including subwoofer and HD Radio™. 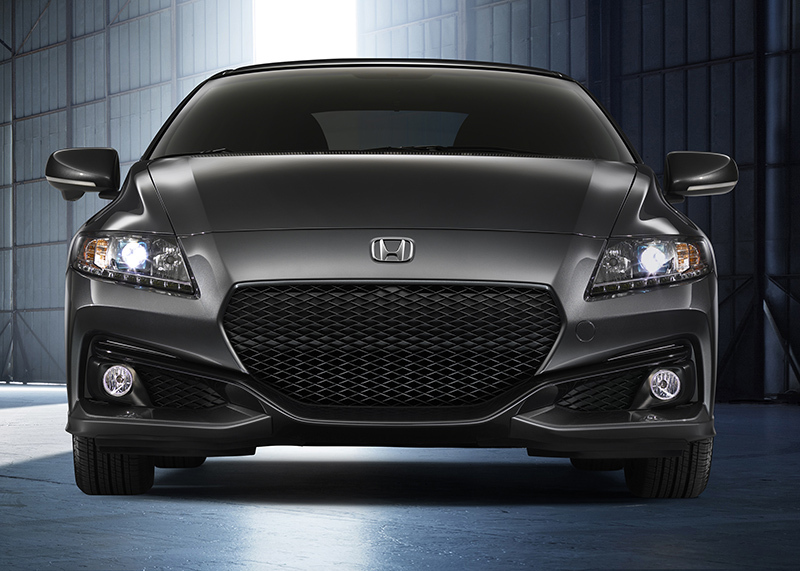 A Honda Satellite-Linked Navigation System™ is standard on the CR-Z EX-L. Included with the Navi system are HD traffic and voice recognition, Bluetooth® streaming audio and an SMS text messaging function. 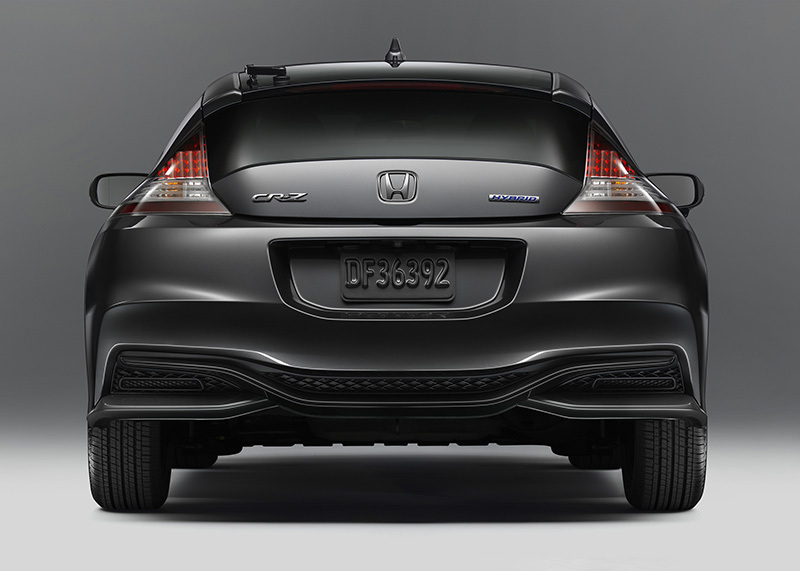 All 2015 and newer Honda models, including the 2016 CR-Z, incorporate a multi-angle rearview camera. Viewable on the 7-inch Display Audio touchscreen, the camera can show a top view, normal or wide view when the transmission is in Reverse. The camera view features dynamic guidelines that help the driver better judge distances and project the vehicle’s future path based on the driver’s steering inputs. The 2016 Honda CR-Z is covered by a 3-year/36,000-mile new-car limited warranty, a 5-year/60,000-mile powertrain limited warranty, and a 5-year/ unlimited-mile corrosion limited warranty. A 15-year/150,000-mile emissions warranty also applies when the vehicle is registered and normally operated in California and certain states that have adopted California Zero-Emission Vehicle regulations. Genuine Honda Accessories are covered by the vehicle’s 3-year, 36,000-mile limited warranty when obtained and installed at the time of original vehicle purchase.